Spacious townhouse with spectacular views of lake and mountain from two decks.Overlooks 9 hole golf,free to guests. Lovely beach on premises as well as Har tru tennis courts,heated pool,playground with bocce court .Trails to walk or cross country ski.Ten minutes from Mt. Sunapee ski area,five minutes from Sunapee Harbor.Close to New London shopping and restaurants.Attractively furnished,air conditioned,wood fireplace. Active Family Paradise: Free golf right outside your door on private 9 hole par 32 course. Four HarTru tennis courts, 2 with lights. Heated pool and playground. Lovely sandy beach on Lake Sunapee. New London Barn summer theater 15 minutes away, Dinner boat cruises in Sunapee Harbor.Fall brings apple picking,crisp mornings and evenings ,golf or tennis in the afternoons and fabulous foliage.Winter,of course,means snow ;downhill skiing ten minutes away at Mt.Sunapee (truly a family mt. ),sledding on our hill ,X-country skiing or sitting by the fire enjoying our panoramic view. Home Away From Home: Four level condo carefully and attractively decorated and furnished.Main level includes full kitchen(with bar stools) which is open to living and dining areas and fireplace with glass doors.Sliding glass doors open to deck and fabulous view.This level also includes a laundry room and powder room.Lower level is a family room with built-in book case,large 32inch t.v.wood stove and walk out area with charcoal grill.On the second floor are three bedrooms.The master bedroom has king bed,air conditioner,private deck and private bathroom .There are two other bedrooms and an additional bathroom on this level.The top level (loft) is air conditioned and has twin beds. We love this area and this community. Even though our primary residence is only three miles away from our condo, we can"t seem to relinquish this property. Spacious townhouse with spectacular views from two decks! 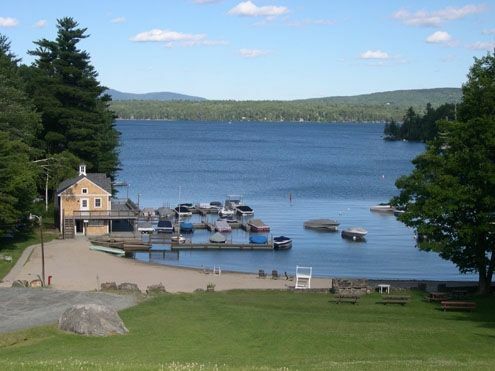 Overlooks nine hole golf course, free to guests.Lovely beach on Lake Sunapee. Four HarTru tennis courts, heated pool, playground with bocce court short walk from the unit. Trails to hike or Cross Country ski on property. Ten minutes from Mt Sunapee ski area . Five minutes from Sunapee Harbor. Close to New London shopping and summer theater. Thirty minutes from Hanover and Dartmouth College. Attractively furnished, air conditioning, wood burning fireplace, flat screen TV.